The latest edition of Fedora Linux was released on January 15th, after 2 months of delay. This community project is sponsored by Red Hat Linux and is one of the primary showcases for the GNOME desktop and its applications. Among the features making their debut is a much improved Samba setup (which is supposed to let you connect easily with Windows’ Active Directory). Also, the Cinnamon and MATE desktop environments which got their start in Linux Mint are available, although not installed by default. 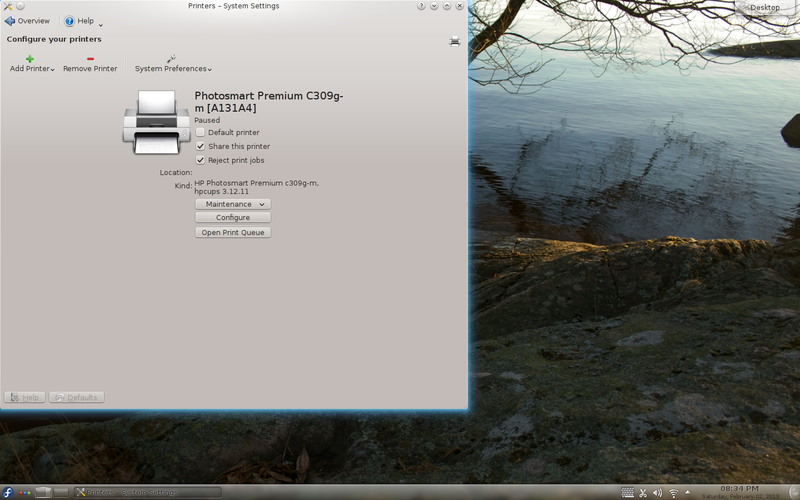 This is my review of the KDE edition of Fedora 18, 64-bit version. After 3 reviews of their main release, I decided it was time to check out the KDE Spin edition. Fedora has several different “Spins”, produced to showcase desktops or emphasize scientific, design, gaming, or other focused interests. Part of the reason why Fedora was delayed for 2 months was that they overhauled and rewrote their installation routine. I found it somewhat confusing. To be honest, I didn’t know that Anaconda needed an overhaul. It has always been a clear installer for me in the past. Here are a few screenshots showing the simplest install you can do – a full install with automatic partitioning on an empty drive. They are included only to illustrate the new look, there is a lot more to the process. I didn’t screw up the installation (I normally dual boot Linux with a Windows 7 system on this laptop), however I did find that there were points where feedback could have been more clear, and I can see how someone with less experience installing Linux would not be confident of how to proceed. Fedora, unlike Ubuntu and Linux Mint, uses a separate root password for administation. After the main installation, the post-install setup lets you assign a user to the administration group, in which case they can use their regular password for installing new apps and performing other system tasks. 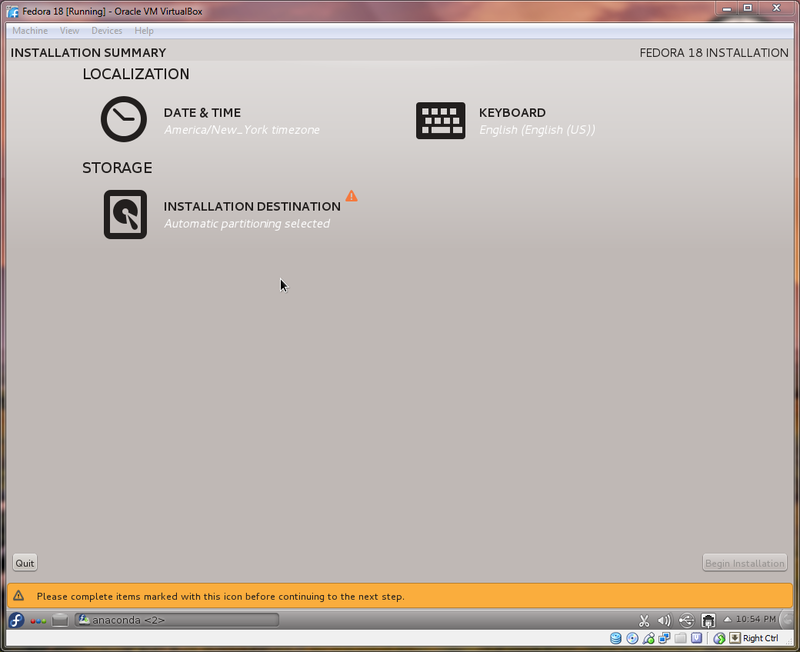 Fedora 18 ships with KDE 4.9 and is what I call a “pure KDE” distribution. You do not start out with Firefox, the GIMP, or LibreOffice installed. The one browser is Konqueror, which I find adequate but not quite as good as Chromium or Firefox. For office work, you get 3 of KDE’s Calligra suite applications – Stage, Sheets, and Write (for presentation, spreadsheets, and word processing respectively). The Calligra Suite is an excellent set of programs but Write does have one drawback which might be a killer for some people: it cannot save in the .docx format, but only in the .odt one. So you can read MS Word files, but unlike LibreOffice, you can’t edit them and then save in the default format that Word is used to. You start with only the 1 wallpaper; however, there are 2 extra groups of backgrounds that you can easily install from the repositories: kde-wallpapers and kdeart-wallpapers. I presume they were left out due to the rather large size of each (> 70 megabytes). You also have 1 desktop, although adding more is very easy, since the pager is already on the taskbar on the left side, next to the Activity Manager. This is in pleasant contrast to some KDE distributions that hide the pager initially. Fedora ships with the 3.6 kernel, but after 2 weeks of updates it’s now 3.7.4. 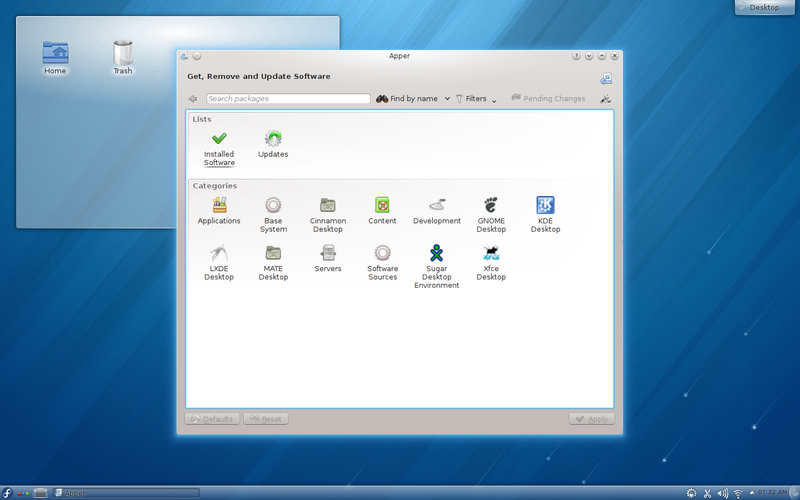 Fedora’s KDE edition uses a tool called Apper to install, remove, and update software, and you are notified of new updates whenever you login. For me, Apper seems a little easier to use than the graphical front end to yum that you find in the standard edition, and I really like it. It offers groups of related software that you can select from, such as Applications, Games, Development, etc. There are no reviews of software like you find in the Ubuntu Software Center, but since I usually know what I am looking for, I found that it suits my needs quite well. Fedora doesn’t include non-free software by default. If it’s important for you to have Flash for videos, Youtube, and games, I’d suggest you install the appropriate Google Chrome browser (32 or 64 bit). It installed quickly for me and works fine, and you are notified of updates the same way as the rest of the software. There are two 3rd party programs that install nonfree software for Fedora – easyLife and Fedora Utils. They have been updated for Fedora 18 now, but at the time that I tried them two weeks ago, they had not been, and I encountered problems using the versions for Fedora 17. My solution was to go to RPM Fusion directly and simply add their extra repositories as instructed on the site. I’ve had no issues updating anything that way. Fedora is also an excellent distribution for programming – this new release features Ruby on Rails 3.2, Python 3.3, Perl 5.16, as well as Haskell, OCaml, and PHP. Also, most of your favorite development environments can be installed – Eclipse, Netbeans, Kdevelop, and Code::Blocks to name just a few. For your artistic side, you have easy access to Blender, Cinepaint, Inkscape, Synfig, and more. Music makers can grab Audacity, Ardour, Mixxx, Hydrogen, and many other creative programs. Updating proved to be a snap, and just as with previous versions, Fedora had no trouble finding my printer. As noted above, Fedora’s KDE edition provides 3 casual games right off the bat – a solitaire card game (KPatience), a Mah Johngg tile matching solitaire game (KMahjongg), and a Minesweeper clone (KMines). The games available in Fedora’s repositories are the very latest versions, and include many favorites from all genres – adventure games, FPS, puzzle games, platformers, card games, and a few roleplaying games. One notable area that it does lack is emulators. I’m not sure why, but Fedora’s standard repos seem to have no console emulators (in the 64-bit edition). This is easily remedied with the addition of the nonfree repositories, but if you are reluctant to use nonfree software, you’re out of luck. The good news is that the nonfree repositories do have nearly all the emulators for consoles that I like to use: NES, Genesis, Gameboy, SNES, Nintendo DS, Gamecube, and original Playstation. The only console I didn’t find one for was the Nintendo 64. The Konqueror browser is prepopulated with links to all the main Fedora websites, and also a few other useful Free Software links. The Fedora Forums are your place to go for help in most cases. 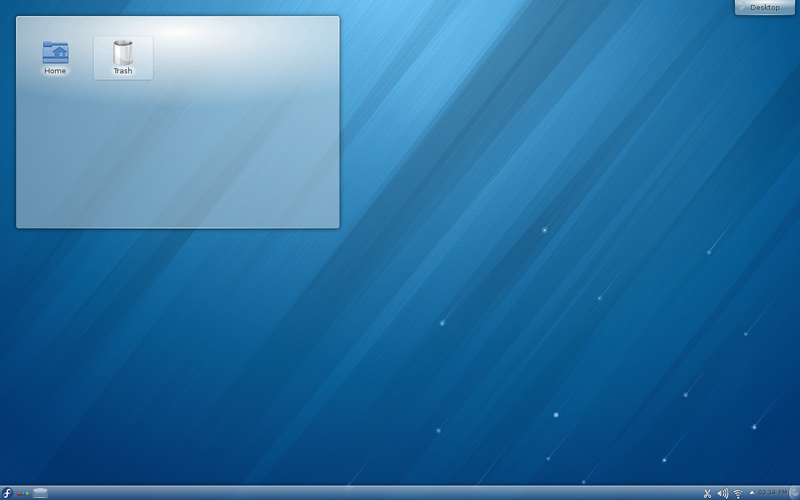 I definitely like the fact that Fedora’s KDE edition does indeed showcase KDE. I am pleased to see that a few casual games are installed, so that you can have a little fun immediately. My laptop has a tendency to overheat, but Fedora runs quite nicely and it is noticeably less hot than when I use Windows 7. 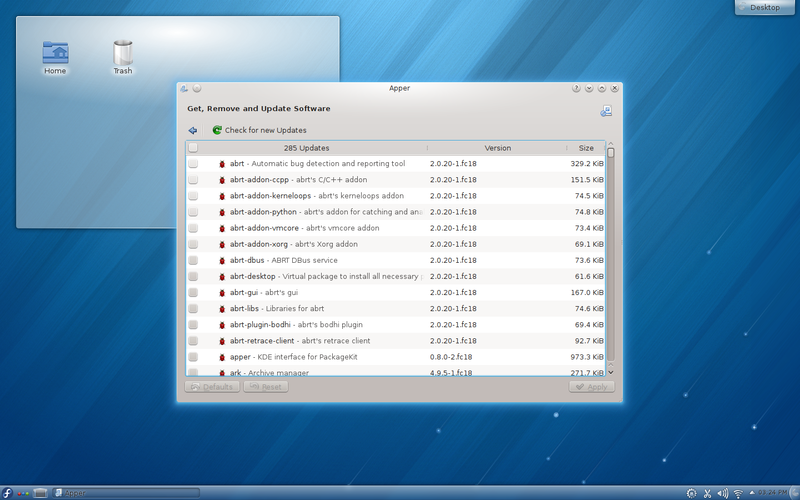 The System menu includes plenty of administrative tools, such as Fedora’s automatic bug reporter, Konsole (the terminal), both the regular and root-mode file managers, the SELinux security tool, and the Release Notes for this edition. I was surprised to notice that neither Krita nor Karbon (the main two graphics applications in the Calligra suite from KDE) were included by default. Kolourpaint is a simpler program similar to MS Paint, while Krita can compare quite nicely to the GIMP, which is usually included in non-KDE distributions. The new installer routine definitely needs either a step by step guide provided at the Fedora website, or more detailed feedback for new users of Fedora. I didn’t use the standard edition of Fedora 18 for very long, and do not want to compare it to this one. I will just say that my experience with Fedora 18’s KDE Spin has been just as pleasant and smooth as the three times that I have used the main edition. I’ve experienced no serious issues, and only one very minor bug (in Apper, the first week I used Fedora. It has not recurred in 2 weeks). All of the programs I enjoy using, as well as the games I love to play, are available to me with this distribution once I add the extra nonfree repositories you can find at RPM Fusion. It is a solid distribution that I can recommend to any person who prefers the KDE desktop to that of Unity or GNOME 3.
you can find detailed instructions about the post-install configuration of Fedora (non-free codecs, Flash plugin, Chrome, and so on). I consider not affordable programs like EasyLife and Fedora Utils.